In 2006, the United States Government Accountability Office (US GAO) issued a report, GAO-07-49, highlighting historical attrition rates in drug development. It recounted that of every 250 development candidates entering preclinical development, only five made it into the clinic. Of that five, only one would be approved by the regulators. Four were destined to fail. Those alarming statistics were confirmed in 2012, when Tuft’s University reported similar figures, with a worsening for the clinic, as five out of six clinical trials were likely to go down. This article contends this is clear evidence that the current drug development system is broken and needs a completely different approach. An alternative approach will therefore be presented, based on Systems Thinking, whereby the incumbent system is turned on its head, with health care professionals co-developing drugs from inception and predictive methods of prototyping employed, preclinic and during clinical trials, to maximum effect. This approach has the potential to be transformational, as a far greater number of compounds are likely to bridge the valley of death to reach commercial success. The world of clinical trials is littered with failures at various stages of clinical development. Roughly 80 percent of clinical studies fail and in the preclinical stage it is over 95 percent. If you live in the world of medicines development, you will be accustomed to the feeling of disappointment and resignation when your project goes south. It is, however, that acceptance of the inevitable that is holding the industry back. There is a better way and this article will outline it, starting by exploding a long-standing myth. Contrary to popular belief, penicillin was not brought to market through an accidental finding by Alexander Fleming. It was the result of intense collaboration between academia, industry, government and the forerunner to the US FDA – the USDA. It was 12 years before the active ingredient in the mold Fleming dubbed penicillin was isolated by researchers at Oxford University. The researchers had no idea how to make it in quantity and it took a member of USDA to work it out. Andrew J Moyer, a USDA employee and expert in the manufacture of molds, devised a process to vastly increase the manufacturing yield and only then could it be in made in enough quantity to satisfy patient demand. Moyer filed for patent in 1945 which was granted in 1948. He was subsequently inducted into the American hall of fame. So why is this significant for clinical trials and the development of medicines? It’s this. If Oxford University and USDA teams had been working with Fleming from the start, penicillin would have launched in a fraction of the nearly 20 years it took; even more crucially, the patent was awarded for the manufacturing process, not a molecule. The hard yards of proving safety, efficacy and manufacturability had been completed BEFORE patent award. Fast forward to the industry as it is today, and we can see where the flaw lay. Based on his discovery, Fleming would have patented as many molecular structures as he possibly could, in the hope that one of them was the magic bullet. His chances of finding it would have been almost nil; one in 10,000 according to the USGAO. He would have selected 250 of those molecules and got five to testing in the clinic (the other 245 would go in the bin). The one that got to market would probably not have been penicillin, rather a poor relation with the bones marketed out of it. The message here is that the industry concluded that drugs are ‘discovered’ by accident, and it took a scattergun approach to drug development on the back of it. This is on top of advancing molecules as development candidates when there was little or no evidence they had any chance of surviving to market. In the case of penicillin, there was very strong evidence the compound within that mold could fight infection; and it is that ‘strong evidence’ that is missing from today’s clinical trials. Witness 30 late-stage clinical trials in Alzheimer’s failing in the last 15 or so years. So what is the solution? This is where whole systems thinking comes in, taken from the world of production systems. The diagram in Figure 1 shows a systems approach to product development, adapted from the Toyota Production System (TPS). 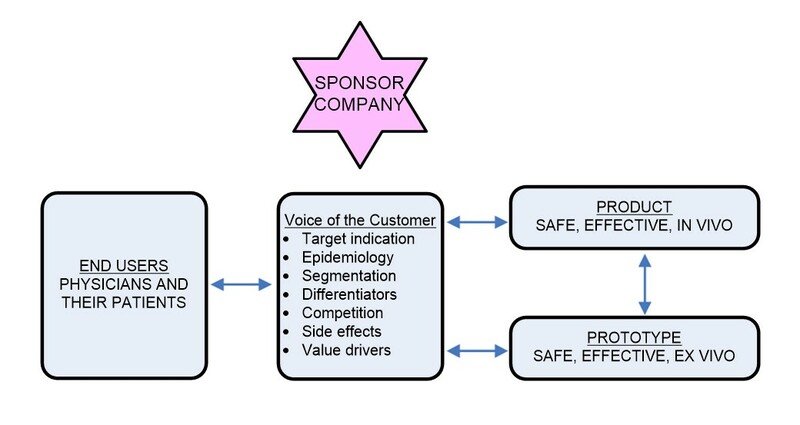 We see the sponsor company starting with Voice of the Customer (VoC) – health care professionals and patients (end-users). Deep engagement with end-users is required at concept stage, before there is any attempt to identify specific compounds. Once new compounds are considered, there is an ex vivo prototyping stage, charged with providing that evidence of safety, efficacy and manufacturability. Only when enough evidence is gathered, would a compound be considered for the clinic. The supply chain would be planned strategically in outline at the prototype stage, working with key suppliers, so that the long, convoluted, arm’s length relationships with the supply base are avoided. That would then provide a firm foundation for a robust, compliant clinical supply chain capable of meeting the demands of commercialization. Hopefully, the above has whetted your appetite for exploring new ways of working in the industry. There is a long way to go, as 40 years of the scattergun approach lay behind us and old habits die hard. BUT, the potential benefits are great, as far more stakeholders are involved in medicines development, leading to many more getting through the rigors of regulatory scrutiny. More on this topic can be found in “Science Seduced Pharma: Time for Engineers to Muscle In,” a Kindle publication based on a webinar held for the U.K.’s Institution of Chemical Engineers (IChemE) Pharma SIG (17th July 2018).